We are delighted to launch our highly anticipated new eLearning Platform (ufotraining.com) and our first comprehensive online training program - Heavy Transport. Why heavy transport? Independent forwarders know that there is a ceiling when it comes to earning revenue from sea, road and airfreight shipments. Although the thought of branching into heavy lift and project cargo is appealing due to the often-healthy margins, the market is very different and the risks are far higher. The clear and highly effective video based training includes narration, graphs, diagrams, video footage and photographs. 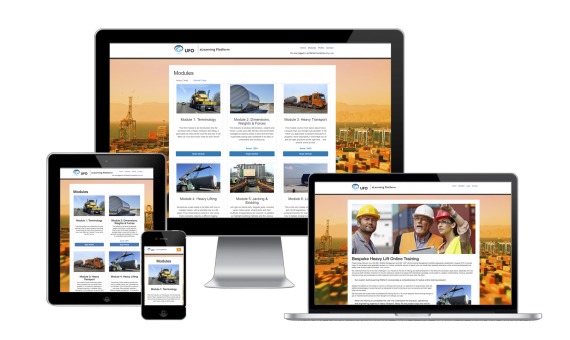 When completed, the user will understand the practical, operational and engineering aspects of heavy transport and lifting projects. Please click here to read more and view an outline of the subjects covered. The training is ideal for staff who are at the beginning of their career, offering employers a time saving and low-cost alternative to workshops and seminars. However, as the training is comprehensive, senior level professionals will also benefit from the practical, scenario and video based course as it will encourage reflection on current practices. Our global organisation covers over 105 countries so our affordable and easily accessible training is available to staff in emerging markets. The program enables everyone to compete on an equal footing with the top industry experts when it comes to learning the theoretical side of heavy transport, heavy lift and jacking & skidding. Each registered user receives a personal log-in so that they can train at their own pace and track their advancement through each module via a progress bar with a certificate awarded upon completion of the course. Besides the benefits of not having to travel to workshops and seminars, there are additional advantages to our eLearning Platform such as being able to stop and start the training at the users’ convenience. The eLearning platform is provided at heavily reduced rates and upon completion, the user will receive a Certificate via courier. To enrol, please complete this form. Future plans include training related to general cargo as well as other specialised areas.